The race toward powering the homes and the cities of the future is underway and students at The Ohio State University are helping to lead the efforts. The power electronics team consist of students (left to right, beginning with O) Matt Foster, Boxue Hu, John Brothers and Jeff Hensal.Electrical and Computer Engineering Professor Jin Wang, of the Center for High Performance Power Electronics (CHPPE) at Ohio State, saw his team of students recently earn the Outstanding Presentation Award at the 2018 IEEE International Future Energy Challenge (IFEC 2018) in Beijing, China for their work in next-generation residential energy storage systems. 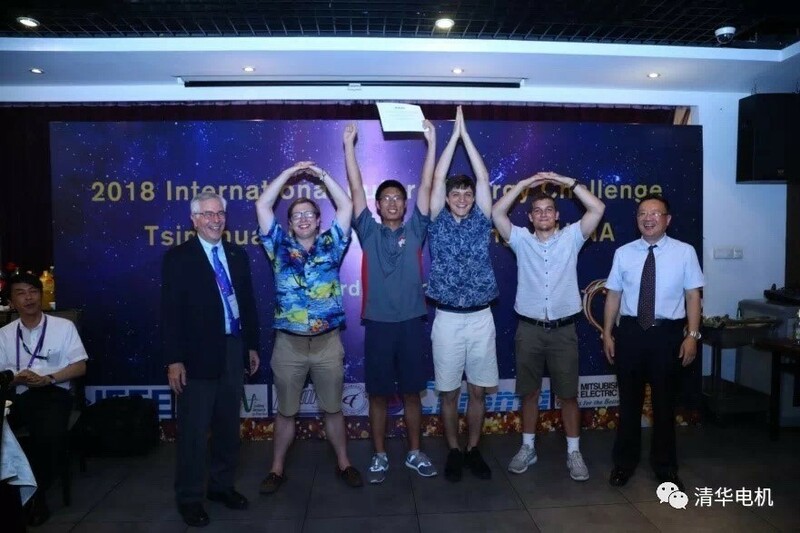 One of ten finalists, the Buckeyes were the only U.S. team to qualify for the final competition held at Tsinghua University in July. IFEC 2018 challenged participants to develop a high-efficiency high power density isolated bidirectional DC-DC converter for residential energy storage systems. Wang said Ohio State's second generation 1 kW 400 V to 40 V bi-directional DC/DC converter achieved 91.5 percent efficiency at the peak power. "The circuit features a quasi-switched capacitor high voltage end, which reduces the voltage stress of GaN devices to 267 V and enables full range soft-switching with simple phase shift control," Wang said. Unexpected control signal glitches botched the team's final test results demonstrating the reverse power flow, he said, but their presentation of the work earned them praise. IFEC is an international student competition for innovation, conservation and effective use of electrical energy, which is open to college and university student teams from recognized engineering programs around the world. The competition is sponsored by the Institute of Electrical and Electronics Engineers (IEEE) Power Electronics Society (PELS), Power & Energy Society (PES), Industry Application Society (IAS) and Power Sources Manufacturers Association (PSMA).